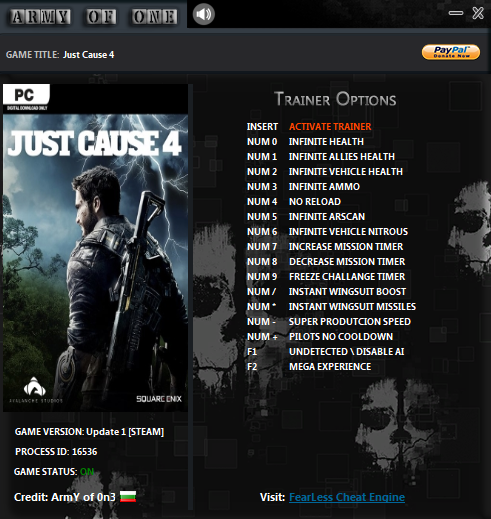 3.Press button "Insert" on your keyboard to activate the trainer (Press "Ok", Wait 1-5 sec.). Trainer crashes when after pressing ok? Instant Wingsuit boost doesn't work. Says the address wasn't found, please restart the trainer and game. After restarting doesn't work. By the way, could you use Original function name, like what it was meant to be, instead of using stuff like "Super Production Speed", "Mega Experience", "Super Pilot Cooldown", and rest. Thanks for making one BTW.